The Sugol Peninsula is a small expanse of land stretching out to the northeast of Nalbadonas. It is bounded on the northwest by the Caphalgi sea, and on the east by the Thalcholphi sea. Its landscape is dominated by the Canwar mountains, and to a lesser extent by the Talethgy mountains situated to their north, seperated by a wide valley. Centuries of human civilisation on the northern half of the peninsula have as yet only tamed small portions of the landscape; The Egwaeon valley, the barony of Elgresar, Cape Corenthal, and the Numoret peninsula. 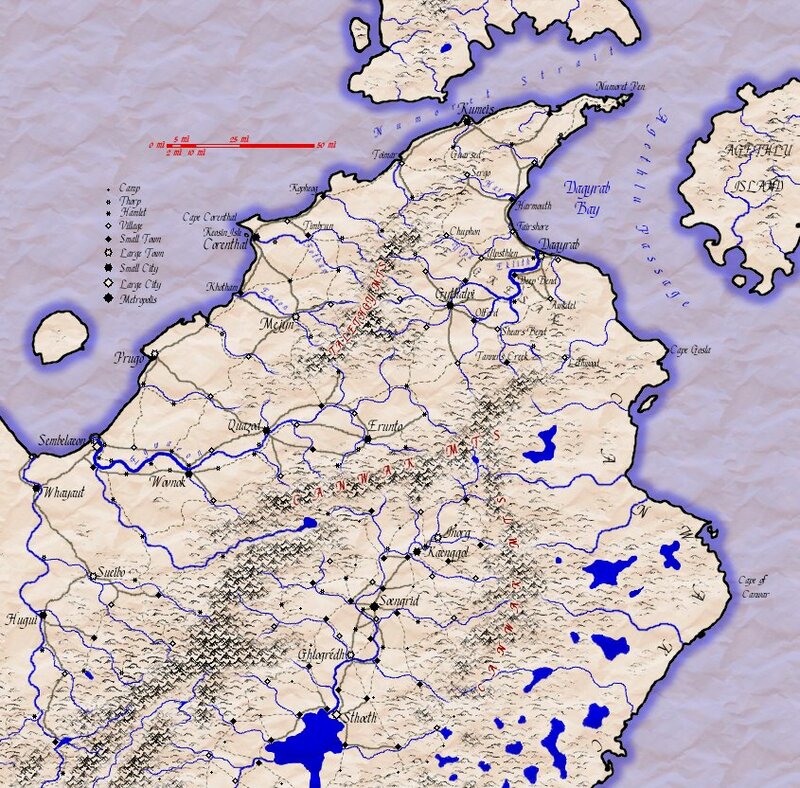 The lands sheltered by the Canwar mountains hide the very densely populated orc kingdom of Chanor. The Canwar mountains themselves are inhabited by mountain orcs and goblins. The Talethgy mountains are also home to some rogue tribes of orcs and ogres. Migrant barbarians were the first humans to inhabit the area, but they did so only for a short period of history before moving on. Crude arrowheads and ancient pottery of theirs can be found at sites of popular encampments and hunting grounds. The purportedly treasure-laden barrows of their great chieftains and their families are rumoured to be haunted by their protective spirits. Following the departure of the Barbarians, the Noru people spread into the Egwaeon valley and colonised the Numoret peninsula. At the height of the Umorit Empire, the port of Rumeis was founded to secure Numoret strait as a shipping route. More recently, the highly successful Tithagryans have settled in Elgresar and Cape Corenthal. For the most part untouched by human activity, the Canwar coast is is an expanse of forest and lakes inhabited by reclusive wood elves. Despite their lesser numbers than the orcs across the mountains to the west, the elves have as yet been well able to keep the orcs to their side of the Canwar mountains. This crook-shaped range of mountains is the northernmost stretch of peaks contiguous with the great dividing Grey mountains of Nalbadonas. Far from the dwarven kingdoms to the south, these mountains are heavily populated by mountain orcs and particularly goblins, and as of yet have not been prospected for mining by humans, due to their perils. This low-lying ridge jutts out into the Caphalgi sea. The waters directly south of the headland are somewhat sheltered from the Caphalgi by the cape and by Reosin island, making a fair haven for the port city of Corenthal, located just to the north of the mouth of the Jotham River. The name of cape also synecdochically refers to the sloping plains and low hills between the Talethgy mountains and some forty miles of coast to either side of the cape itself. This heavily populated kingdom ruled by surface orcs is located in a wide plain in the middle of the northernmost reach of the great Grey mountains of Nalbaeon. King Glordagh rules from his throne in the city of Soengrid. Humans and other races are slaves to their orcish masters in these lands. The Egwaeon Valley is ruled by a loose confederation of four Noruvalon city-states, all built along the Egwaeon River. Erunto, nearest the headwaters, Kwazod, Wovnok, and Sembelaeon on the river's delta. The Barony of Elgresar is ruled from the city of Gythalpi, situated on a narrow strip of land between the North and South Eklith rivers. At the mouth of the Eklith is the port city of Dagyrab, built on the Eklith's delta on the shores of Dagyrab bay. The Numoret Peninsula is alow hilly angular promontory reaching northeastwards from the northen tip of the Sugol peninsula. Colonised early on by Noru, it guards the shipping passage of Numoret Strait. The port city of Rumeis governs the surrounding lands. The Talethgy Mountains divide the duchy of Elgresar from the region of Cape Corenthal. They also form the northern bounds of the Egwaeon Valley. In addition to bears and wolves, they are home to a couple tribes of wild mountain orcs, as well as some bands of ogres and goblins.